French Photo Du Jour: Mamma Mia: Très Bien! It was an awesome show. And yes, it still worked for me, even though the songs were all translated into French. As soon as I heard the first note of each chanson, I knew what it was about and could fill in the blanks... So I didn't find it disconcerting (concert pun intended here...) at all. When the story was over (finishing with "I Had a Dream") and before the final bows they did a few songs --including my fave "Dancing Queen"-- in English. BTW, when that one was done earlier in French, it remained Dancing Queen, not reine, which is the French word for queen. No, I didn't wear my bellbottoms, but I did sing along at the end, like everyone else. 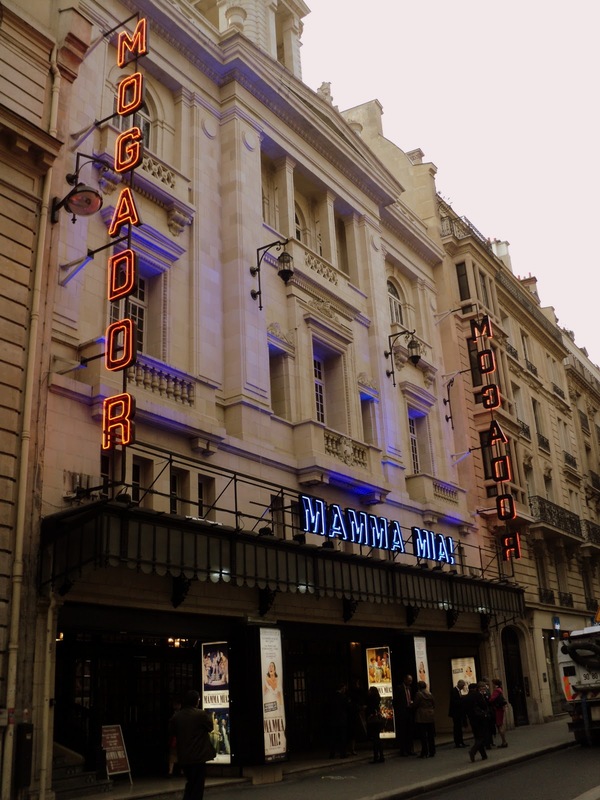 So if someone asks you to go see it, my advice would be: "Dit oui, dit oui, dit oui..." (That's how the song "I Do, I Do, I Do" was altered....) It's playing at the Mogador Theater in Paris until at least June. Or if you live near Orléans... no problem... they've announced two dates for the Zenith... in February 2013!